Puppy training techniques have changed over the years, and modern puppy training methods are good news for you and your canine friends. Many dog trainers learned their trade while training dogs for the military of the 1940s and 50s. Military dog training was based on the notion that the dog is your adversary in the training field, and you must dominate him before he dominates you. The training process became an extremely rigorous temperament test, very physical, almost brutal. Such methods do nothing to enhance or preserve a loving, caring relationship that modern owners want and expect. “The idea was to make sure poor temperament would show up in early training rather than on the battlefield or in the trenches. So if they’re going to break, break them when it’s not important,” says Dr. Ian Dunbar, a behaviorist in Berkeley, California. “These methods applied to pet dog training, of course, are totally unsuitable.” While these methods remain in practice today, equally effective and more humane options are available. The theory of operant conditioning and reward training deals with relationships between stimuli, responses, and consequences—the puppy learns that what he does is critical to what happens next. Instead of simply reacting to avoid punishment the puppy learns to think—associate your “come” command with receiving positive attention. The traditional coercion methods relied on waiting for the dog to make a mistake, then using leash-jerk corrections and physically pushing and positioning the dog. With the new protocol, puppies are encouraged to want to perform the task on their own. 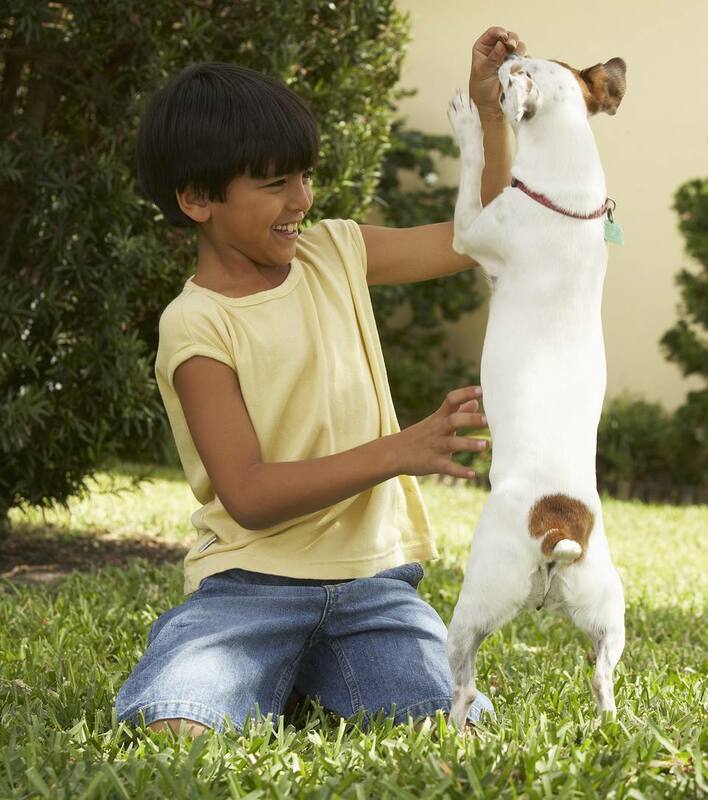 Dr. Dunbar urges owners to see pet dog training from the dog's point of view. “Training should be efficient, effective, easy, and enjoyable, or pet owners and the dogs won’t do it,” he says. Some of the newest training tools reflect this evolution in training philosophy. Tools like the Easy Walk Harness communicate with dogs in a natural fashion with gentle pressure, preventing them from jumping up or lunging forward. The Halti and the Gentle Leader head halters fit over the dog’s face, and with gentle guidance, gets even giant-size dogs to go where guided—no jerking necessary. The more traditional slip, Martingale or "choke" collars must be fitted appropriately and used correctly. A quick jerk-release directs the dog’s actions. But if fitted wrong, the collar won’t release the pressure, so a pet owner can easily hurt the dog by accident. Puppies and toy dog breeds are particularly prone to injuries like collapsed trachea and can be permanently damaged by a jerk to the neck. Electronic collars—those that deliver a remote-controlled low-impulse shock to correct poor behavior—are even more controversial. Many ethicists object to their use altogether. Even proponents agree that only professional trainers are qualified to use electronic training tools. E-collars train based on punishing bad actions rather than rewarding good behavior and dogs often revert to old habits and run away unless they wear the collar all of the time. No puppy should EVER be fitted with a shock collar. Period! Other training techniques teach pets to recognize the desired behavior by linking the action to appropriately timed verbal praise, sound signals such as a clicker training tool, or “cookie” (food) rewards. Whether you use a head halter, a clicker or verbal command, or cookie power, the major part of training involves teaching the puppy or adult dog to want to comply. Puppies are little sponges and they absorb lessons quickly. Your baby dog starts to learn the moment he sets paw in your home, and one of the most important lessons is to teach him that learning is fun. By six to eight weeks of age, your puppy can easily learn basic commands simply by teaching him how to learn. Puppies that enjoy training eagerly lap up more challenging tricks and commands as they mature. Please avoid using the word “no!” when your puppy does something wrong. It’s so overused that some puppies begin to believe that “no” is their name. Remember that training is learning, and puppies learn by making mistakes so they know what won't work, and choose better options. A more powerful training word is “yes.” Find opportunities to say “yes!” by catching your puppy in the act of doing something you like. If he does something unacceptable, instead of shouting “no!” try to find a method that encourages him into a legal alternate behavior. Look for opportunities to reward good behavior and replace bad choices with acceptable ones. Puppies have short attention spans. Several short training sessions of about five to ten minutes each will be more successful than a single marathon training time. Set up a schedule in your routine so that you know your puppy has the energy and eagerness to learn. A good time is before meals because you can use a portion of his meals as treat rewards during training, without upsetting his nutrition.